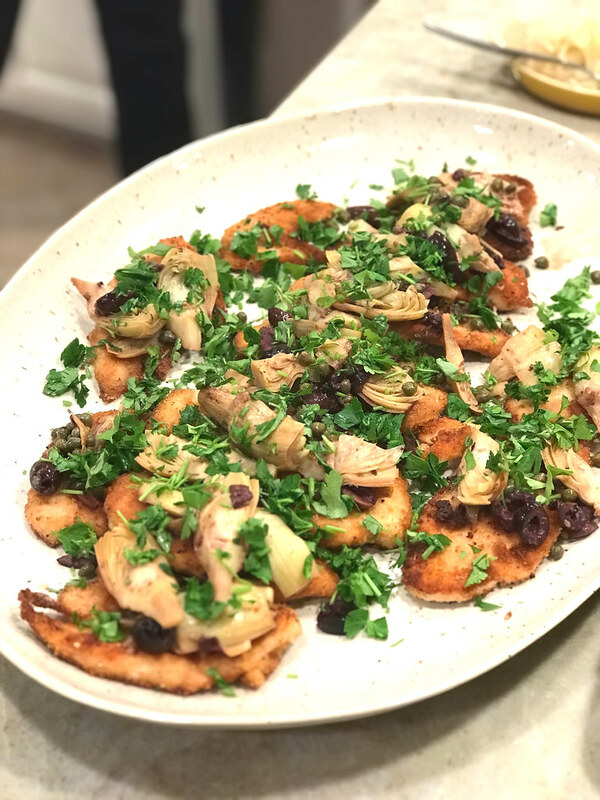 I love this chicken piccata recipe because it combines the best of both worlds: crunchy fried chicken and tangy, briny vegetables. This dish is easier to make than it looks and it’s perfect for springtime, showcasing tender artichokes — but without all of the prep. 1. In a large bowl, combine the bread crumbs with the salt and pepper. Dredge the chicken cutlets in the seasoned bread crumbs. 2. In a large skillet, melt the butter in the oil over moderately high heat. When the foam subsides, add the chicken to the skillets (working in batches if needed) and cook over moderately high heat, turning once, until golden brown outside and white throughout, about 4 minutes per side. Transfer the cutlets to a platter. 3. Wipe out the skillet and add the olives and artichoke hearts. Cook over medium heat, stirring, until heated through. Add the chicken stock, lemon juice and capers and boil for 1 minute, stirring. Spoon the artichoke and olive sauce over the chicken, sprinkle with the parsley and immediately.